The Aborigines Protection Act 1886 (Act no. 1886 (50 Vict. No.25)) was passed on 2 Setember 1886 and commenced on 1 January 1887. The full title of the Act is 'An Act to provide for the better protection and management of the Aboriginal Natives of Western Australia, and to amend the Law relating to certain Contracts with such Aboriginal Natives'. This Act established the Aborigines Protection Board and enabled the appointment of Protectors of Aborigines. It gave wide powers to the Board and Protectors to involve themselves in the lives of all Aboriginal people in Western Australia, including the care, custody and education of Aboriginal children. The Act also empowered Magistrates to apprentice Aboriginal children to work to the age of 21 years. Part of this Act were repealed in stages, from 1889. The Aborigines Protection Act 1886 came into effect in the Crown Colony of Western Australia on 2 September 1886. As outlined in the Act, its purpose was to 'provide for the better protection and management of the Aboriginal Natives of Western Australia, and to amend the Law relating to certain Contracts with such Aboriginal Natives'. However, it was very broad in the way it addressed those objectives. The Act established the Aborigines Protection Board which was given a range of functions. The Board was appointed by and subject to the Governor, could administer funds granted by the Legislative Council, and was required to provide regular reports on the welfare of Aboriginal people in the colony. Section 6 set out the duties of the Board, which were generally to take a role in dispensing 'welfare' to Aboriginal adults, but it also gave the Board the power to involve itself directly in the lives of Aboriginal children. Section 6(3) required the Board to make submissions to the Governor 'any proposals or suggestions relating to the care, custody, or education of the children of Aboriginals'. Section 6(6) enabled the Board to 'exercise a general supervision and care of all matters affecting the interests and welfare of the Aborigines. The Board could also make regulations (s.7) to help give effect to its functions. In this way, the Act extended the functions that had previously been outlined in the Industrial Schools Act 1874, (s.18) which made it 'a duty' for any Justice of the Peace in any district 'make inquiry' about any 'native' or 'crossbreed' child who was 'apparently under the age of twelve years' and who was 'not living under the care or guardianship of either father or mother'. If the inquiry led the Magistrate to have any concerns, the Industrial Schools Act 1874, made it lawful for him to 'assume the guardianship' of that child. The Aborigines Protection Act 1886 enabled the Governor to appoint Protectors of Aborigines, who would 'conform to the instructions of the Board' in terms of expenditure, report to the Board on welfare matters, and 'institute, carry on, or defend' any legal actions, 'enforce' any judgements or orders 'for or on behalf of any Aboriginal, and either in the name of the Aboriginal or of the Protector' (s.17). This 'protective' role essentially gave the Protector the right to assume that he would always be acting in the Aboriginal person's best interest, and the power to do so. The Act (Part 2) also regulated the employment under contract of Aboriginal people over the age of 14 years and (Part 3) the employment of Aboriginal people who were prisoners. In Part 4, the Act enabled Aboriginal children to be indentured to an employer until they reached the age of 21. Section 36 enabled 'any Resident Magistrate, acting under the instructions of the Board, to bind by indenture' and place any child of Aboriginal descent with 'any master or mistress willing to receive such child in any suitable trade, business or employment whatsoever' until the young person was 21 years old. The actions of the Resident Magistrate in doing this were to be as if the young person themselves had chosen the placement voluntarily ('as if the child had been of full age, and had bound himself to be such apprentice'). The magistrate was required to 'inform himself, as fully as he can, of the child's age' and to write that age on the indenture. The approximate age of the child as determined by the magistrate would then become the child's 'true age without further proof'. Thus, if a child were deemed to been younger than he or she was, the period of indenture would be longer. The Resident Magistrate was also supposed to ensure that adequate provision was made in the indenture for 'proper and humane treatment' and appropriate clothing and maintenance of the young person. Section 37 outlined how complaints by apprentices, employers or Protectors of Aborigines were to be dealt with; and section 38 enabled decisions to be taken about the apprentice if his or her employer died. Section 39 made it lawful for any Justice of the Peace or Protector of Aborigines to inspect apprentice's place of employment or residence to 'ascertain whether the terms of the said indenture' had been 'fulfilled'. Every Aboriginal Native of Australia, and every Aboriginal half-caste or child of a half-caste, such half-caste or child habitually associating and living with Aboriginals, shall be deemed to be an Aboriginal within the meaning of this Act, and at the hearing of any case the Justice or Justices adjudicating may, in the absence of other sufficient evidence, decide on his or their own view and judgment whether any person with reference to whom any proceedings shall have been taken under this Act is or is not an Aboriginal. Lois Tilbrook remarked in Nyungar Tradition (p.63) that the Act therefore 'distinguished between people of mixed Aboriginal and European descent who lived with Aborigines and who were classed as Aboriginal, and those who did not associate with Aborigines and who were therefore not classified as Aboriginal themselves'. The definition of Aboriginality was important for children, too, as it determined which children were subject to the powers granted under the Act. The Aborigines Protection Act 1886 was repealed in a number of stages. 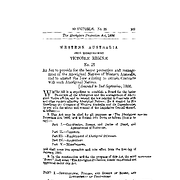 Part I of this Act was repealed by the Aborigines Act 1897 (Act No.5) on 28 March 1898; Parts II, III, IV and V were repealed by the Aborigines Act 1905 (Act No.14) on 23 April 1906, the remainder was repealed by the Statute Law Revision Act 1964 (Act No.61) on 4 December 1964. The Aborigines Protection Act 1886 and the Industrial Schools Act 1874 were two pieces of legislation that enabled the colonial authorities to intervene in the lives of Aboriginal children in Western Australia. The Aborigines Protection Act 1886 established the Aborigines Protection Board. Sources used to compile this entry: To Remove and Protect: Aboriginal Lives Under Control [website], 2010, http://aiatsis.gov.au/collections/collections-online/digitised-collections/remove-and-protect; Tilbrook, Lois, Nyungar Tradition : glimpses of Aborigines of south-western Australia 1829-1914, Online version published by the Australian Institute of Aboriginal and Torres Strait Islander Studies in 2007, University of Western Australia Press, 1983, http://aiatsis.gov.au/sites/default/files/catalogue_resources/m0022954.pdf; Law Research Service, Melbourne Law School, Law Library, The University of Melbourne. 'Find and Connect Project - Western Australia Legislation', 13 December 2013, held in the project files at the University of Melbourne eScholarship Research Centre.